"To Serve, To Protect, To bring Justice and Peace to the Galaxy"
The Freedom Warriors was a legion of soldiers devoted to the protection of the Jedi and and all that the Galactic Alliance stands for. Upholders of Peace and Justice, they were fearless; fanatical at times and stubborn in their endeavours for duty and the cause. Freedom Warriors provide Military and Security reinforcement to assist Governments and Organisations under the Galactic Alliance. With professional troops trained especially to assist The Jedi Order, since its resurrection in Year 12 it grew to help protect the territories it operatec in. To achieve this, recruits were hand picked and underwent an extensive training program. Freedom Warriors instilled in their recruits that teamwork, constant training and communication is paramount to achieving goals and missions. Freedom Warriors were versatile and could alternate between military and civilian duties. "It's the intense camaraderie that makes the Freedom Warriors so different to others, it is a name that holds mystery and fires the imagination. To us the spirit of Freedom Warriors is devotion to comrades and total achievement of the mission and cause, it is essential to the way we operate. The bond that a Freedom Warrior makes with his/her comrades is a bond that will never be broken." It’s not truly known when the Freedom Warriors were formed. Many of the records after the Civil War were destroyed and lost, scattered across the galaxy. In between the Years -25 to -22 it is believed that the Legion of Freedom Warriors made it’s first appearance. The Galactic Republic at this time were embroiled in conflict with the Confederacy of Independent systems. 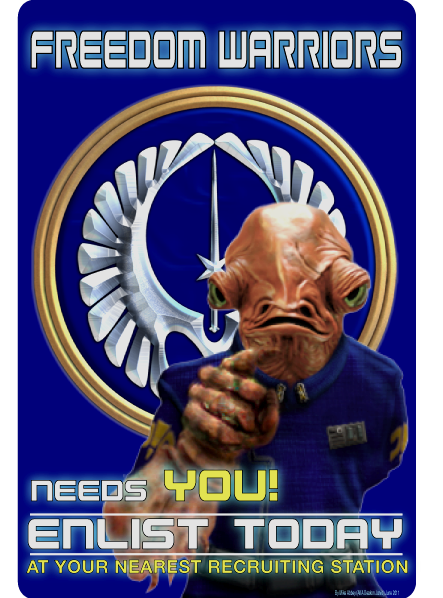 Supreme Chancellor Hiram Drayson was granted emergency powers by the senate, and began annexing fleets and armies of those still part of the Galactic Republic. Though some believed diplomacy could of been used and investigate with more time on certain mysterious events like the convenient order of building a Clone Army from the aquatic world of Kamino where they specialised in biological cloning Facilities. The next three years of heavy fighting began to spread through out the known worlds. Stretching the Jedi depleted ranks from the constant attrition of the Galactic Civil War. Despite the use of the large Clone Army to help, units like The Antarian Rangers (whom have served over 600 years) began forming to serve and protect, as well as achieve covert missions without endangering the Jedi. These guardian elite units were trained and were assigned with or without the Jedi Knights. It was about this time that the Freedom Warriors were born, though no source shows where they were based. By the end of the Year -22, the war began to change when a group of confederacy leaders made a rash attempt to seize Coruscant. They were captured by a group of Jedi infiltrating there flagship. Later they were murdered in their cells and rumours of the Jedi Order involvement spread, leading to a meeting in the Supreme Chancellors office. Drayson and a few Jedi were about to discuss the accusations when they were attacked by the Sith. Drayson survived the attack with force lightning and lightsaber burns to address the senate that he believed the Jedi were behind the events of the betrayal of the Galactic Republic. The “Order 66” was executed through the Galactic Republics Clone Army to murder all Jedi and their faithful allies. Drayson then announced the forming of the Galactic Empire to the thunderous applause from the senators. The Sith Lord Vodo Bonias watched as Drayson helped in his master plan of the destruction of the Jedi and their faithful servants. It was then the Sith appeared from hiding, attempting to kill their puppet Drayson whom had out lived his usefulness, but he fled into exile. With the help from the head of the Imperial Army, Balsaraph, then named Suntzu to be Emperor of the Galactic Empire following a brief skirmish between ships loyal to the two authority figures. The Senate was dissolved by the new despot supported by the Sith, many former senators fled the core worlds, fearing persecution at the hands of the tyrannical government. The establishment of new regional Moffs had made the Senate obsolete. Many of the former senators flocked together in the outer rim, making their formerly underground resistance a full scale rebellion with an organised military. The reign of Emperor Suntzu only lasted less than two months and was a design created by the Dark Lord Vodo Bonias to strengthen his own coming to ascension of the throne and to allow the Sith to set up a shadow organisation within the ranks of the Galactic Empire, including Officers like Spytek and Simms. Little more then one month after that Suntzu was named Emperor Vodo Bonias removed Suntzu from the throne of the Galactic Empire and claimed it for himself. Balsaraph, who willingly had helped Bonias to overthrow Drayson and place Suntzu on the throne felt betrayed and embarked for the rims. Several months later Balsaraphr met up with the former Emperor Drayson. The two exiles merged their forces and formed the Order of Darkness [OOD] as a tool to take back the throne. But the Imperial war machine supported by the Sith easily destroyed their opponents making it an futile attempt. 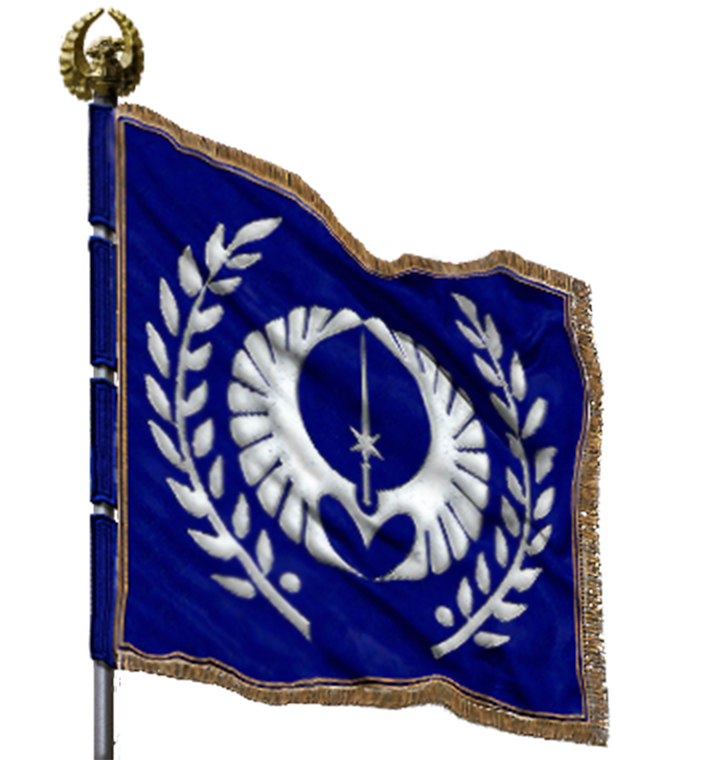 The following years remained somewhat calm as the Imperial Military strengthened their hold of the core systemsand expanded outwards, incorporating more and more system into the Empire. But in the outer rims rumours could be heard about the organisation known as the Rebel Alliance and no one could say what the future would hold for the galaxy. Order and stability, peace and democracy, only one thing was certain war was once again coming to the galaxy. The Freedom Warriors were similar to The Antarian Rangers in organisation and use with the Jedi Order in heavy operations. It is believed they received special training from the Jedi Knights attached to the Legion to counter sith influenced troops, giving them an elitist status. Sources are mixed if Force users were part of the legion, but definitely all species were accepted into the ranks. There are no known history data if they wore distinctive uniforms, had an emblem to represent the Legion or a true form of structure of the unit. The total destruction of the organistion was traumatic that only a few known survivors were left that they fled and joined the Rebel Alliance or went into hiding, leaving a legacy to fade in the fires and ashes scattered across the galaxy. Commander Wuma Uxal-Lumir was betrayed by Jett Blackheart. Mr. Blackheart assassinated his former superior and took control of the Freedom Warriors. Shortly thereafter he would rebrand it Silhouette after the former outfit he was in under the command of Coeus. This page was last edited on 23 February 2017, at 15:06.